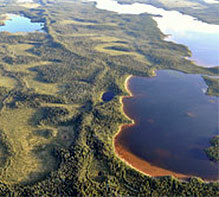 The Assinica national park reserve spans 3193 km2 in the boreal forest. This protected area is located approximately 20 km north of the Cree village of Oujé-Bougoumou and north of the town of Chapais. Close to one-fifth of this national park reserve is composed of bodies of water, the largest of which are the Broadback, Assinica and Brock rivers and lakes Waposite, Comencho, Opataca, Cachisca and Assinica. In Cree, “Assinica” means “full of rocks.